Ms. Rodríguez said that young people want a Church that does not give up in the face of adversity – when confronted with migration, violence and abuse of all kinds. Young people want the church to be the trending place of charity. She told journalists that she felt very emotional but wanted to say how touched the young people were when the Synod Fathers humbled themselves and apologised for what has happened in the Church that should never have happened. She said that young people don’t want to be directed, they want to be accompanied. Young people move away from the Church because an encounter is missing, they don’t encounter people who love what they are doing. If you love what you do, it is conveyed to others by the way you live, she said. With great enthusiasm she said that young people, like her, want to share the energy they have for their faith like a hurricane – one that brings something good. Cardinal Wilfrid Fox Napier, OFM, of South Africa said that there were a number of elements missing from Africa in the Synod document. He expressed the hope that they will be captured in the final document. He said that in the West many young people are leaving the Church but in Africa young people are searching in the Church. He also mentioned how some families remove their children from school and put them into situations of child labour so that the can make ends meet. This means that children are not getting an education, and so the cycle of poverty continues. The Cardinal mentioned bribery and corruption in governments which have a massive impact on the wellbeing of African youth. Cardinal Juan José Omella Omella said that the Holy Father is always with the Synod in the gathering of the general assembly. He says he listens and takes notes and clearly shows the gathering that what they are doing is something important and significant. He says Pope Francis is always respectful, he knows how to listen and he knows when to speak. The Cardinal said that the Holy father spoke once, he summarised what had been said and made an important input himself. 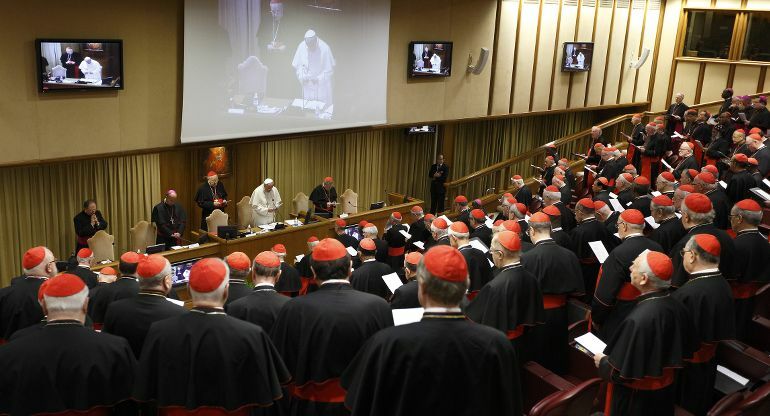 He said that when people speak the Holy Father looks at them, gives them attention, no matter who they are – young people, curial officials, bishops, auditors and members of other churches who are observing the Synod.